Austin Clarke’s most recent book of poetry – which was shortlisted for the Governor General’s Award in October – has now been shortlisted for the Trillium Book Award. Where The Sun Shines Best tells the story of three Canadian soldiers awaiting deployment to Afghanistan who beat a homeless man to death on the steps of their armoury after a night of heavy drinking. The poet, whose downtown Toronto home overlooks the armoury and surrounding park, describes the crime, its perpetrators, the victim, and a cast of homeless witnesses that includes the woman, a prostitute, who first alerts police. The subsequent trial evokes reflection on the immigrant experience the poet shares with one of the accused, and on the agony of that young soldier’s mother. From Kandahar to Bridgetown to Mississauga, Ontario, Where The Sun Shines Best encompasses a tragedy of epic scope, a lyrical meditation on poverty, racism and war, and a powerful indictment of the ravages of imperialism. The public are invited to attend a special reading on June 16, 2014 where the finalists will read from their nominated works. The event will be held in the Bram & Bluma Appel Salon, Toronto Reference Library, 789 Yonge Street (doors open at 6:30 p.m. and the readings begin at 7:00 p.m.). The winners will be announced on June 17, 2014 at a dinner in Toronto. Previous Trillium Award Winners include the world-renowned writers Alice Munro, Margaret Atwood and Austin Clarke, who won the award in 2003 for his book The Polished Hoe. 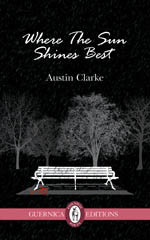 Tagged with Austin Clarke, Poetry, Trillium Book Award, Where the Sun Shines Best.